– Matthew Barrett, who has served since 2015 as lecturer and tutor of systematic theology and church history at Oak Hill Theological College in London, will serve MBTS as Associate Professor in Christian Theology. Barrett is the author of a number of books, including Reformation Theology; God’s Word Alone; John Owen on the Christian Life; and Four Views on the Historical; as well as the founder of Credo Magazine. – H.B. Charles, Jr. — pastor of Shiloh Metropolitan Baptist Church of Jacksonville and Orange Park, Florida, and author of the books On Pastoring and On Preaching — and Steven Smith — pastor of Immanuel Baptist Church in Little Rock, Arkansas and author of the books Dying to Preach: Embracing the Cross in the Pulpit and Recapturing the Voice of God: Shaping Sermons Like Scripture join Midwestern’s Spurgeon Library as Senior Preaching Fellows. “Rarely does a seminary get to add to its faculty an individual with the gifting and accomplishment of Matthew Barrett, H.B. Charles or Steven Smith,” said Midwestern President Jason K. Allen. “Rarer still, does an institution get to simultaneously add three such individuals. Pastor Charles and Dr. Smith are two of this generation’s most well-known and gifted preachers and teachers of preaching. 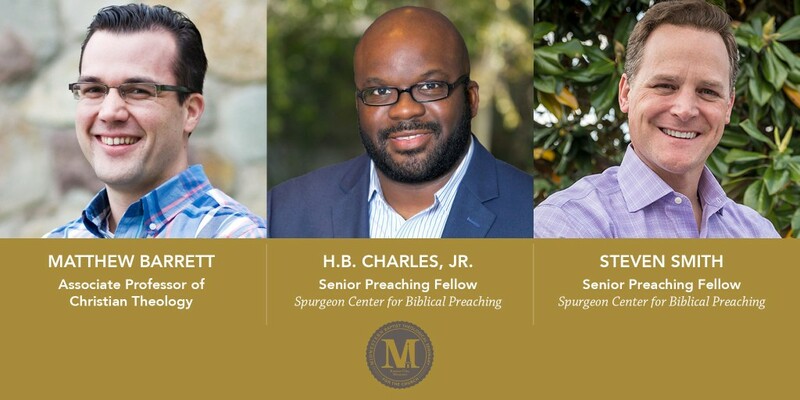 They represent so much of what is right about great preaching and are eager to share their ministries with Midwestern Seminary and as an extension of the Spurgeon Library.